Every year local residents in my area, including employee volunteer regulars from Merck and Whole Foods, get the call to help out with the Wissahickon Creek Spring Cleanup. This yearly event is held by the Wissahickon Valley Watershed Association. For a few hours we wade and scramble up and down the banks of our assigned sections along the Wissahickon Creek, picking up plastic water bottles, junk food wrappers, and other colorful but not-so pretty litter. Often we find ourselves pulling and dragging old bikes, tires, bed springs, baby carriages, and other large unusual items from the creek. Afterwards, there is a picnic in one of the parks along the Wissahickon Creek. This year the picnic was held at Militia Hill State Park, which is one of my favorite places to find birds, especially migrating warblers. 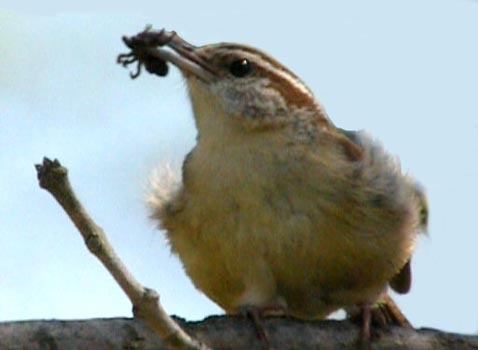 Even as we sat and ate our burgers, or bean and rice salads, or homemade cookies, I saw a Carolina Wren hopping through the rafters above our heads inside the picnic shelter, where she had a nest. Blue-gray Gnatcatchers rasped in the branches of surrounding trees, while further on I could see two Red-bellied Woodpeckers chasing each other from tree trunk to tree trunk. Not sure what goodie she’s got but I’m glad it wasn’t part of the picnic fare. But the highlight bird of the picnic was Charley, a Senegal Parrot (Poicephalus senegalus), with the engaging personality of a debonair party hostess. Charley, which is short for “Chartreuse”, is about 9 years old—just a young adult for a Senegal, which can live up to 30 years. 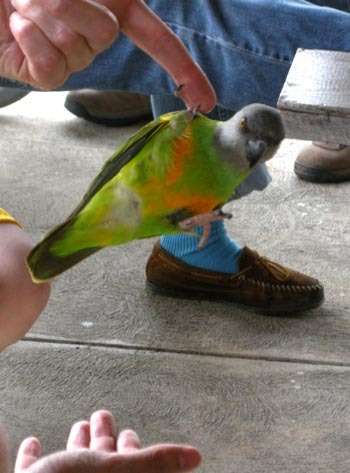 Her human, Jerry, explained that while we were being treated to a mature, well-behaved bird, he and his wife were not spared the “Terrible Twos” that Charley passed through. 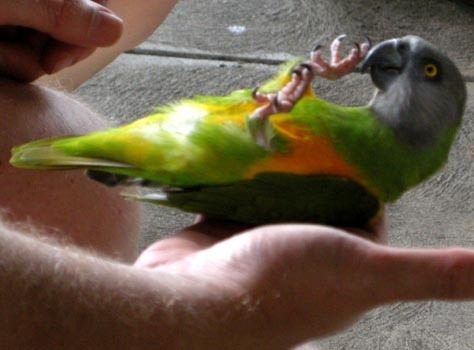 Knowing something about bird acting-out behavior from having babysat friends’ birds, I imagine this charming parrot shredding anything less resilient than steel, screeching just because it feels good, and climbing onto anything her little talons can grip, nipping at anyone who might object. But you would never know now. Pleasant and comfortable with this large group of people, Charley was passed around from finger to finger, as folks of all ages wanted to hold her. 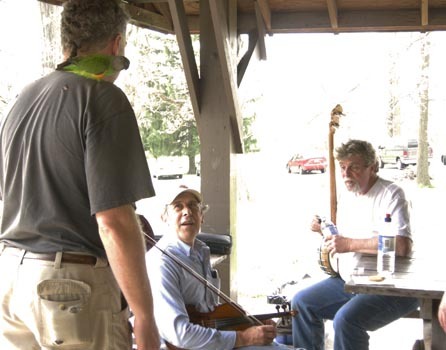 Then to add to the spirit of Charley’s presence, two of the picnickers arrived with a fiddle and banjo. 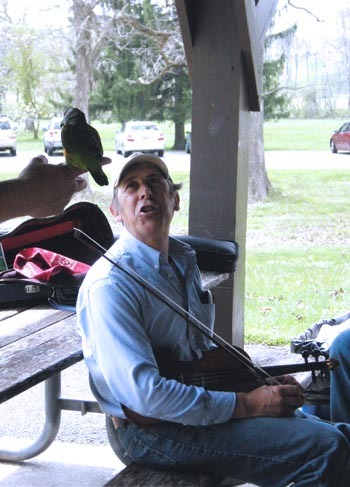 I had taken up the fiddle recently, and had met these two musicians at a couple of old time jams; The Main Line Old Time Jam at the Gryphon Cafe in Wayne, PA and the Old Time Jam at the Mermaid Inn, in Chestnut Hill. So their arrival with instruments was a pleasant surprise for me. Now Charley could perform her gymnastic tricks accompanied by some old time tunes. The Single-claw Dangle was best done to “Blackberry Blossom”. I look forward to cleaning up the Wissahickon Creek next year. It won’t just be for the great picnic afterwards, but I will hope to be treated to Charley’s presence and some old time music. I plan to bring along my fiddle, too. 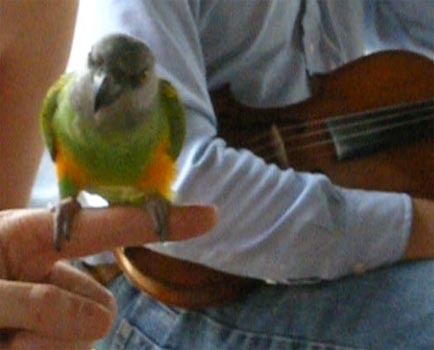 Guess I better get some requests ahead of time from Charley, the chartreuse parrot.